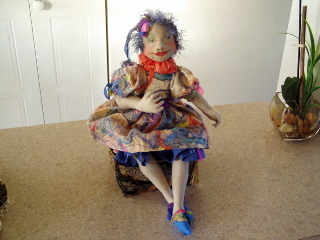 Doll designed by Virginia Robertson. 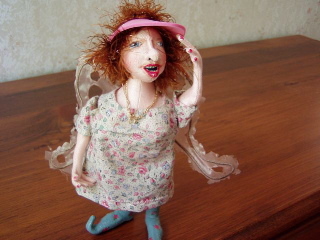 Doll made by Aileen turner. Polyester stuffing dress made by sandwiching; ribbons, satin threads and glitter threads, between hand dyed cotton and fine netting. "Truffle" designed by Peggy Wilson. for face painting, shoes and stocking. filled with polyester stuffing. Heads made with robe velour "Cafe". Faces are painted using Gel pens and Prismacolour pencils. 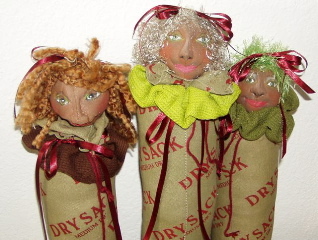 Various yarns are used for the hair. was designed by Aileen for a challenge/swap. 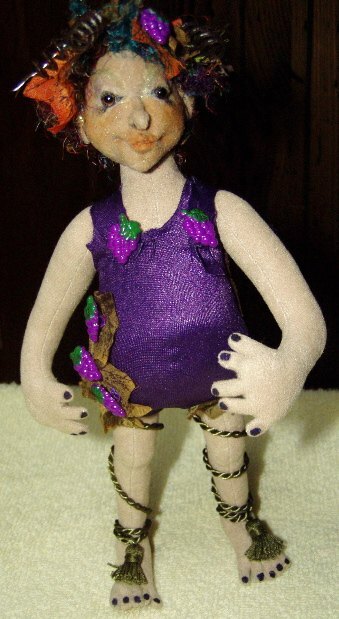 The challenge was to make a doll depicting your favorite beverage. Aileen's being "red Wine". 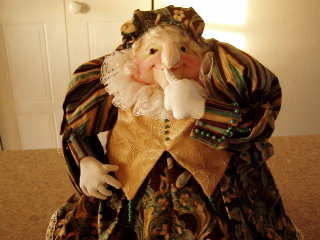 He has a wire armature with polyester stuffing "Fairfield", His body is made with robe velour "sand". His face is colored with Prismacolor pencils and Gel pens. His costume is "lycra", grape leaves and cording and buttons.